Intuition is a guidance from your inner being. It is a manifestation of divine consciousness. Innate to each of us, intuition is an often ignored gift because we are taught to have more respect for thoughts presented to us from the outside world than for the voice within ourselves. 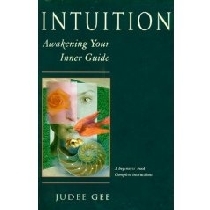 Judee Gee helps you to awaken, channel, and express your intuitive self. Through guides meditations, simple rituals, awareness exercises, and the principles of inner alchemy, you can rediscover and realign with your inner voice. Turn the mystery of intuition into a tangible catalyst for personal transformation! Essential to emotional and physical health, to creative self-expression, and to understanding others, it can help you recognize and realize your spiritual potential. Learn how to use intuition as a guide through doubts, fears, and adversities. Perceptive and practical, this book delivers a heart-felt invitation to the liberation of your intuitive inner being.